Author(s): Harry F. Luglio. Department of Nutrition and Health, Faculty of Medicine, Universitas Gadjah Mada, Jalan Farmako, Sekip Utara, Yogyakarta. Obesity is a worldwide problem that adversely affects human health. 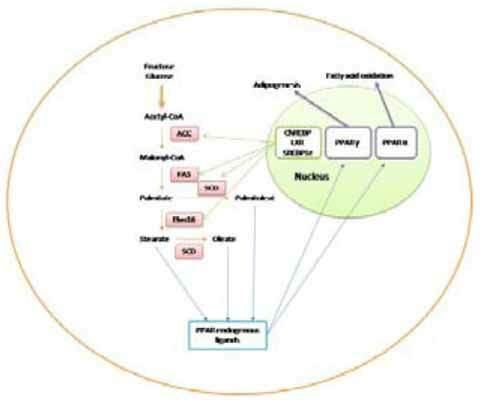 Genetic factors have been suggested to play role in the development of obesity. SNPs on proteins involved in de novo lipogenesis had been proposed to affect individual susceptibility for obesogenic environment. De novo lipogenesis is the process of converting carbohydrate absorbed from dietary intake into fat and this process usually occurs after a high carbohydrate intake. In modern society, where foods and beverages with highly processed carbohydrates are getting affordable, understanding the role of genetic factors has become more crucial. In this review, several genes that were previously reported to influence the risk of obesity has been pointed out. This observation was supported by previous findings in animal model which showed that genetic knock-out of genes involved in de novo lipogenesis (FASN and SCD-1) was found to be related to changes in obesity phenotype. Those genes not only produce enzymes which directly convert carbohydrate metabolite into fatty acid, but also influence the production of lipogenic enzymes. Keywords: de novo lipogenesis, FASN, fat, genetic, obesity, SCD-1, SNP. Affiliation:Department of Nutrition and Health, Faculty of Medicine, Universitas Gadjah Mada, Jalan Farmako, Sekip Utara, Yogyakarta. Keywords:de novo lipogenesis, FASN, fat, genetic, obesity, SCD-1, SNP. Abstract:Obesity is a worldwide problem that adversely affects human health. Genetic factors have been suggested to play role in the development of obesity. SNPs on proteins involved in de novo lipogenesis had been proposed to affect individual susceptibility for obesogenic environment. De novo lipogenesis is the process of converting carbohydrate absorbed from dietary intake into fat and this process usually occurs after a high carbohydrate intake. In modern society, where foods and beverages with highly processed carbohydrates are getting affordable, understanding the role of genetic factors has become more crucial. In this review, several genes that were previously reported to influence the risk of obesity has been pointed out. This observation was supported by previous findings in animal model which showed that genetic knock-out of genes involved in de novo lipogenesis (FASN and SCD-1) was found to be related to changes in obesity phenotype. Those genes not only produce enzymes which directly convert carbohydrate metabolite into fatty acid, but also influence the production of lipogenic enzymes.